Pour yourself a very BIG drink, and get comfortable – this is VERY long….. Although the following essay is primarily concerned with the shore establishment HMS Fisgard at Hardway 1904-1932, the story actually begins some considerable time before, and elsewhere. The ‘Leda’ class 46-gun fifth rate frigate HMS Fisgard was launched at Pembroke Dockyard on 18th July 1819, and commissioned on 27th August of that year; she was immediately placed ‘in ordinary’ for the next 24 years, not seeing active service until (very briefly) 13th May 1843, when she was sent to the Pacific for a short time. 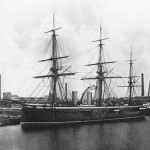 She returned in the same year, and was designated the harbour flagship at Woolwich until 1872; between 1848 and 1872, she was also used to train engineers, and as a depot ship. Paid off 8th October 1879, and sold for breaking. 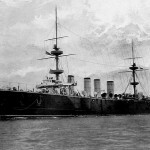 By 1903, the First Sea Lord, Admiral Sir John Fisher, had become concerned about the threat by the Imperial German Navy, being worried that their technical expertise may be overtaking that of the Royal Navy. He initiated a programme which would be able to train engineers & articifers in the latest technology, and within two years, training centres were established at Chatham, Plymouth, and Portsmouth (Gosport). 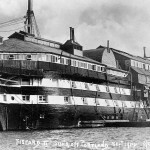 The Gosport establishment, which would consist of hulks moored at Hardway, was named HMS Fisgard, in recognition of the ship which had trained engineers at Woolwich between 1848 and 1872. 1) The first hulk was HMS Audacious, the lead ship of a class of four ironclad battleships, launched on 10th September 1870 at Govan, spending most of her active life on the China station. Hulked in 1894, becoming a depot ship for destroyers at Felixstowe c.1902-1904. 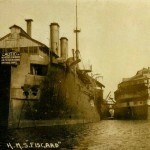 Renamed Fisgard in April 1904 at Hardway, thus becoming Gosport’s first Fisgard. 2) Next in line (literally) was HMS Invincible, although I can’t find the date she arrived in Gosport; she was renamed Fisgard II in 1906. HMS Invincible had been launched on 28th May 1869, being of the same class as HMS Audacious (‘Audacious’ class). 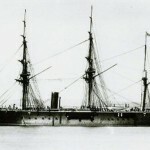 Mostly served in the Mediterranean & Cadiz, but visited China when transporting a new crew for HMS Audacious in 1886; upon her return, she became guardship at Southampton until 1893. 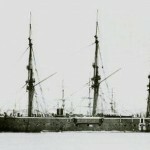 Her engines were removed in 1901, and found a new role as a depot ship for destroyers at Sheerness until 1906, being renamed HMS Erebus during that time. 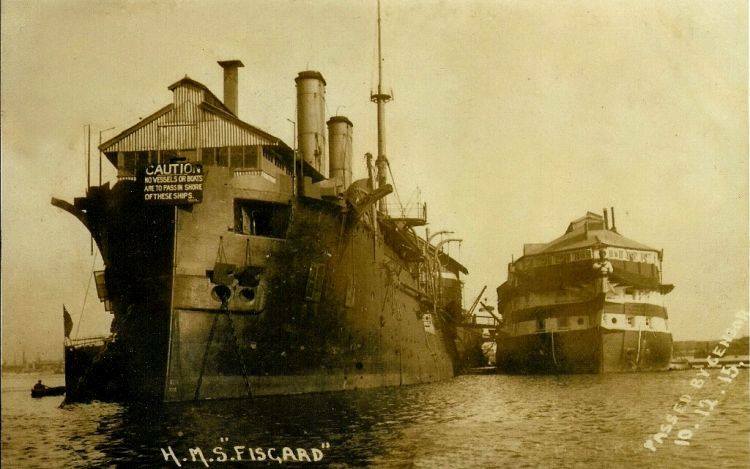 She joined HMS Fisgard in Gosport in 1906, and was renamed Fisgard II. 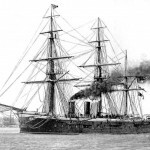 4) HMS Sultan was the fourth hulk, renamed Fisgard IV; she was a broadside ironclad, launched in Chatham dockyard on 31st May 1871, named in honour of Sultan Abdülâziz of the Ottoman Empire, who was visiting when the ship was laid down in 1867, and upon whom Queen Victoria bestowed the honour of making him a Knight of the Garter, and showed him a fleet review at Spithead. She served in the Channel Fleet and the Mediterranean, and on 6th March 1889, hit an uncharted rock between Malta and Gozo, and slowly flooded through the gash in the hull. She sank on 14th March when a gale dislodged her from the offending rock. The ship was raised in August by an Italian firm, at a cost of £50,000, and was taken into Malta harbour on 27th August 1889. 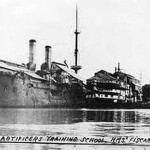 After the damage was patched up, she returned to Portsmouth for repairs and modernisation until 1896, then put into reserve until joining HMS Fisgard in 1906. All four of these hulks were together commissioned as HMS Fisgard on 1st January 1906 (another reason I find some of the dates suspect). In 1914, and because of the declaration of WW1, Fisgard (ex-HMS Audacious) was taken to Scapa Flow to become a repair workshop & recieving ship, and renamed HMS Imperieuse. At the end of hostilities, she was moved to Rosyth, and scrapped in 1929. Similarly, and for the same reasons, Fisgard II (ex-HMS Invincible) was to be used at Scapa Flow as a recieving ship for seamen who had been mobilised for the war, but on 17th September 1914, while under tow, she sank off Portland Bill during a storm; 21 of the crew of 64 were lost, and the wreck remains there today about 164ft below the surface. These two were replaced in 1915 by HMS Spartiate and HMS Hercules; they were named Fisgard and Fisgard II respectively on 17th July 1915 (‘allegedly’). 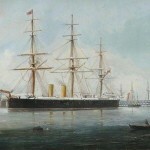 5) HMS Spartiate, a ‘Diadem’ class protected cruiser, was launched on 27th October 1898 at Pembroke, and delivered to Portsmouth, where a catalogue of problems prevented the ship being completed until March 1903, facts seem a bit thin on the ground after that, until arrival at Hardway, save for being used as a stokers’ training ship from 1914 until becoming Fisgard. Sold in 1932, and scrapped in Pembroke. 6) HMS Hercules, a central-battery ironclad, was launched on 10th February 1868; served in the Channel and the Mediterranean, guardship in the Clyde 1878-1881, then flagship of the reserve fleet 1881-1890. 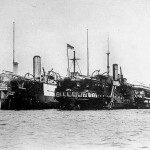 Modernised 1892/93, in reserve at Portsmouth until 1904, when she was renamed HMS Calcutta, serving as a depot ship at Gibraltar until 1914, by which time the engines were inoperable, and resembled a hulk; towed back to Portsmouth and joined HMS Fisgard as Fisgard II. 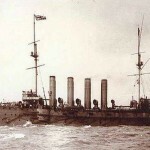 7) These four were joined by HMS Terrible in 1919. She was a ‘Powerful’ class protected cruiser, launched on 27th May 1895 on the Clyde; when completed in 1897, Terrible and her single sister ship Powerful were the largest cruisers in the world. 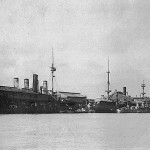 Both ships were mostly based on the China station, but Terrible was involved with the relief of the seige of Ladysmith in February 1900, returning troops to Portsmouth. 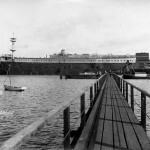 The two ships were laid up after 1904 as an economy measure, and mostly disarmed in WW1 for use as troopships, and later, accomodation ships. Named Fisgard III in 1920, when Fisgard III (ex-HMS Hindostan) was sold, and renamed HMS Hindostan, but broken up in 1921. By 1930 all operations were concentrated at Gosport, but the decision was made to move the whole thing ashore in Chatham, and the hulks were all sold in 1932, except for Fisgard IV, which was retained as a depot ship and renamed HMS Sultan, a role which she fulfilled until 13th August 1946, when sold for breaking. I’m not certain of her location. So, that was the end for HMS Fisgard as far as Gosport is concerned, but in 1939, and the arrival of WW2, more articifers were needed; however, it was felt that Chatham was rather vulnerable – in the direct line of fire, so to speak, so establishments were set up in far-flung outposts in October 1940: Rosyth in Scotland (HMS Hibernia), and Torpoint, Devon (later commissioned as HMS Fisgard in December 1946). In 1983, HMS Fisgard and the rest ceased to exist, their role being taken over by the training establishments at HMS Sultan (Gosport), HMS Collingwood (Fareham), and HMS Daedalus (Lee-on-Solent). Upon closure, the Daedalus role was incorporated into the programme at HMS Raleigh (Torpoint, Devon); HMS Raleigh still has a Fisguard Squadron, and a training ship is permanently moored there, HMS Brecon (M29), a ‘Hunt’ class mine countermeasure vessel, launched in 1978, and commissioned on 18th December 1979. She assumed her new role in February 2008. As something of a sidenote, HMS Brecon was the first ship in the Royal Navy ever to be commanded by a woman Captain….